Theme for this event was ‘Tsugunaga Momoko’. The event was split into two parts, where Momochi would answer 50 questions from the fans during each part, for a total of 100 questions. Twitter hashtag for the event was #ももち (#Momochi). This post covers the first part. The second part is in this post. Entering to the tune of Peanut Butter Jelly Love, Momochi waved to the camera that was streaming to the Osaka Hello! Store. Momo: I can’t hear you! 💢 Okay, one more time! You guys in Osaka, give a round of applause! I can see you! Don’t let your mind wander! Unlike other events in the 1001 Nights events, regular chairperson Nishiguchi-san would not be appearing at this event. Q1. Kumaicho is flourishing as a model and a general talent. At this moment, is there anything that you would like to tell her? Out of the blue, we're talking about Kumaicho? While we were both at the HinaFes and Satoyama Satoumi event at Makuhari Messe, the only time we met was when we passed by one another. She was going to a Matcha-zu activity, while I was heading to Country Girls' booth. When we passed by one another, she said, 'Momo, you're so tiny~', and that was it. There were a million more things that she could have said, right!? Next time we meet, I hope that she has something more tasteful to say. Q2. I'm currently studying for qualifications that will help me realise my dreams. 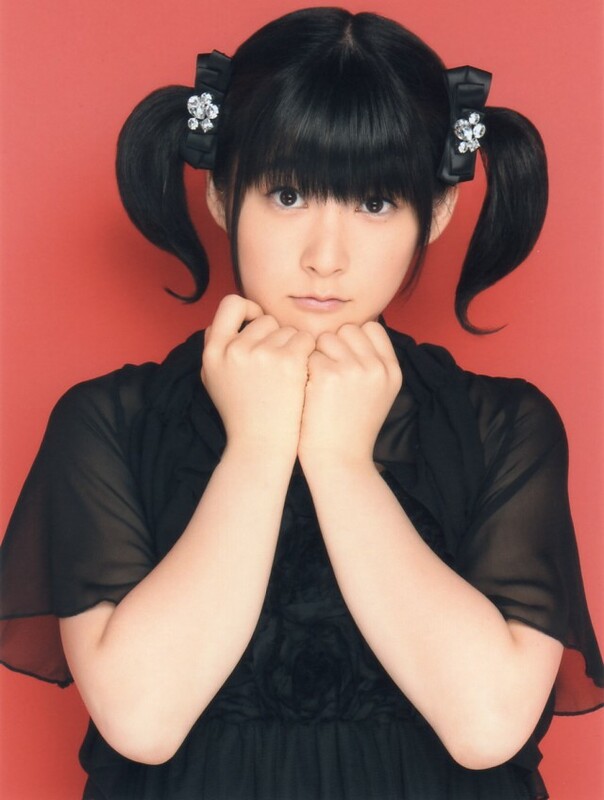 Momochi, is there a trick to how you kept yourself motivated when you were doing both studies and work? Is this person here? What are you doing? Graduate school? Vocational school? You've got to work hard at it. What difficulties are you facing? Is it because I'm graduating? Everyone's sad about that, so it's the same for everyone. Anyway, if I visualise things going smoothly, things do go smoothly. So it'll be fine. Q3. Your brother has mentioned that in Country, his preference looks-wise is Chii-chan, and Yanamin personality-wise. What if, in ten to fifteen years time, your brother is going out or is married to Morito or Yanagawa? I wouldn't want to give Yanamin's children New Year's money. But thinking about it again, I pity my brother, he must have a hard time. After all, he's been brought up with someone as cute as me in the family. Any girl will get compared to Momochi. Wouldn't that inflate his standards? Q4. How is it like when you feel Fuku-chan's gaze on you? It's doesn't frighten me, but if we're close, I put some distance between us. And Fuku-chan doesn't come to talk with me. With that distance between us, it really feels like we are idol and fan. When I watch Fuku-chan perform on-stage, I feel like cheering her on as an idol, but nothing beyond that. She’s good friends with Yamaki Risa-chan though. This is what I suspect - Fukumura Mizuki-chan likes me, and Yamaki Risa-chan likes Michishige-san, right? I'm sure that they exchange information about Michishige-san and myself between one another. Q5. What would you do if your children want to become idols? Well, they’re my children, so it's safe to assume that they’ll be cute and get scouted. Well, if that’s what they want to do, I might as well let them do it, right? I’ll support them. But it's important that they themselves want to do it. If they don’t want to do it, I won’t be an insistent mother who'll force them to keep on with it. Since idols can’t go on if they don’t want to. Q6. What's the secret to your ability to be so loved? Does any member in Country have the makings of that ability? Everyone has that ability to be beloved. I think that you're loved too. 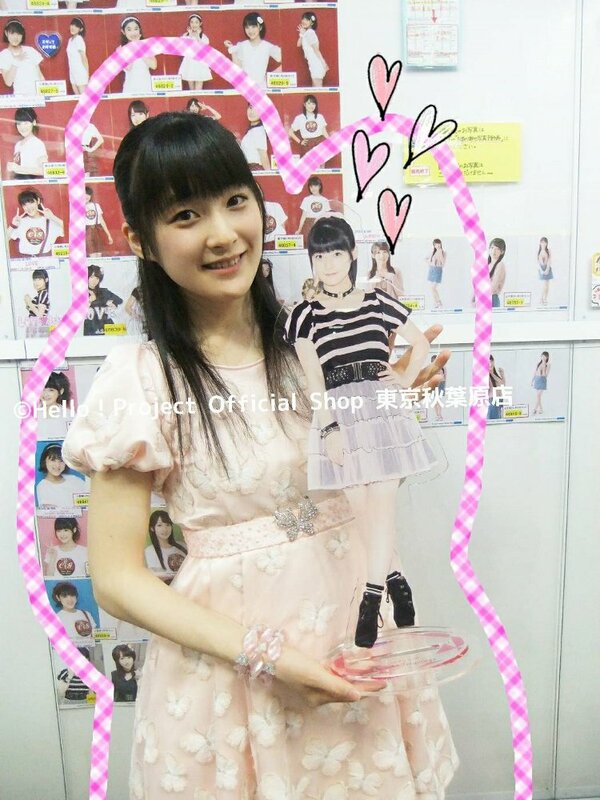 No one who likes Momochi can be a bad person. So you’re a good person. As for my secret? Whatever I do, I do with a smile. Are there any of you who came here after work? Ah, there are. Now, is there anyone here who is confident enough to say that you greet people with a smile that comes from the bottom of your heart at all times of the day? Whether you've just got into office or are about to leave? Virtually none of you, see. There aren't many people who can greet everyone with a smile. But that's what an idol can do. Truly, that is what I believe, from the bottom of my heart. I've become so used to it that it's become customary, like how I apply eye drops when my eyes get dry. That's my secret. It's the same with the members of Country Girls. They're all affable. Some of the other H!P members are afraid of me. And yet, while they're with Momochi, Country Girls are still friendly. 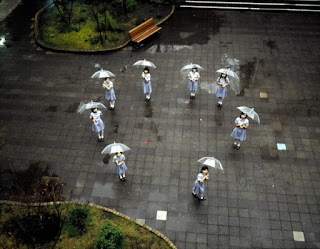 I think that with their friendliness, they'll all be loved. Q7. Did you want to become the leader of H!P? I mean, aren’t I qualified? Isn’t that unbelievable? She’s the worst. Q8. Will you have a final showdown with Michishige Sayumi-san? We’re both grown-ups. So we won’t do that. Q9. Among the songs you've done in H!P, what are your favourites? What songs do you like to sing, what songs do you enjoy? Songs that don’t have particularly aggressive dances, or much dancing at all. But if it was Suki-chan, I'd be all for it! I like cheerful pop songs, with easy-to-remember dance moves. Q10. Do you go the Kenshuusei performances because you like children? What do you talk about? Rather than saying that I’m going there for the Kenshuusei, you could say that I go there to mess around with Shimizu Saki-chan. But yes, I do like children. You really like these kind of stories of my relationships with the Berryz members, don’t you? Q11. Any behind-the-scenes stories from the cooking classes with Miyabi-chan and Kurokki? That was the first time that Miya and I were at the cooking shoot location. Miya was really excited on that day. What made me happiest was getting to eat that sashimi. What fish was it? Alfonsino? The alfonsino sashimi was delicious! We kept on eating while making small talk after the shooting ended. And then, someone who was probably Kurokki’s superior came in and remarked on how the two of us were the only ones who ate until the very end. Q12. What led you to becoming a Yuzu oshi? Hmm? Ah, I normally call them Yuzu-sama out of respect. It’s fine for you guys to refer to Momo-chan as ‘Momo-sama’ as well. You know, can I say this? It felt like it was destiny. I was going to be on a show with them, a quiz show where they brought together celebrities who were fans of Yuzu-san. Back then, I didn't know much about them. The only thing I knew was Eikou no Kakehashi. I was in a position where it was all right for me to be on the programme without knowing a thing. But I had been in the same clueless position when we recorded the previous episode of the show the week before. That led me to get a scolding from the staff, telling me that even in my position, I should be prepared, that I wouldn't be doing my job if I really didn't know anything. And so, I did my research on Yuzu-san to prepare for the programme. Learning about them and listening to their songs spurred my interest. And when I went on the show with them, they were really nice. They were super adorable! They’re really good at singing, and yet they do comic roles at their concerts. Such entertainment! Thinking about it now, I was so clueless, I was the worst!! You don’t think it was bad? Imagine if, for example, there was a gathering of people who like Berryz. Would it be acceptable for them to only know Special Generation? I’d like to go back in time and give a whack on the head to the me of the past. Q13. Will you be careful about overeating in July and beyond? Yeah, I think I’ll put on weight. That's a likely risk. Q14. What’s the longest you’ve ever slept? I slept at 8 p.m. and woke up the next day at 2 p.m. That was plenty. I love sleeping. Morito Chisaki-chan feels guilty if she oversleeps on days off, so she was amazed. Q15. Have you contacted Maimi-chan or Mano-chan recently? I don’t think you have any close friends besides Mano-chan though. They wished me happy birthday via LINE, that’s it. Q16. I find it sad that Momochi will no longer be around from July onwards. What shampoo and conditioner do you use? I’d like to use the same one, to feel like Momoko. No way! Please stop it. Use ones that fit with your hair type. Please stop it with these questions!! Hmm? Well, you’re talking about yourself, right? Q17. If there was an audition for a 2nd gen Momochi, what qualifications should be judged? They have to really like being an idol. Also, their face. After all, my face is definitely what’s captivating about me. Q18. Who is your rival? If I were pushed to say, I’d say the me of yesterday. Q19. What big wish do you have? I hope the world will become peaceful! Q20. What’s your favourite ramen topping? Do you ask for seconds? I recently learnt about the benefits of menma. I didn’t know that bamboo shoots were so nutritious. It’s almost suspicious. I don’t really ask for seconds unless I’m in Hakata. Recently, I’ve been having small helpings. I ate too much when I was in Berryz - ramen, donburi, spaghetti. Q21. What songs have you been listening a lot to lately? I’ve been listening to my dinner show songs on repeat. I’ve only been focusing on remembering the lyrics. Nothing else. It’s gotten harder to remember things now that I’m 25. I can’t keep up recently. Even though I’m the kind of person who doesn’t bring work back home, recently I’ve been had to do so since I had to learn those songs at home. Q22. What Momochi-isms would you like to pass down to the Country members through your hall tour? I think they’ve all been conveyed by now. After this, I want the members to show what they've learnt. Q23. Will songs like Rhythm ga Yondeiruzo! and Viva!! Barairo no Jinsei be released? What about songs from the Country Musume。 era? I don’t know anything about it though. Q24. Is it a coincidence that Yanamin often seems to be next to you at handshake events? It’s not a coincidence. I think it’s been established as me, Yanamin, Musubu-chan. As they were first getting started, they were both designated to be next to me. It’s remained that way since. Yanamin will come to talk to me before handshakes. I'm glad, but the topics that she’ll talk about with me will be what she’s talked about before in the dressing room. Yanamin always stretches out her neck to talk with people. Even when we’re on the Shinkansen, separated by the aisle, she'll still peer towards me, neck stretched out. I ignore her in the Shinkansen though. I mean, we can’t be talking loudly over the aisle, can we? Q25. What do you want to do in your private time from July onwards? I’d like to eat lots of pizza or karaage in the middle of the night, like at 2 in the morning. Rice too. I'm not holding myself back or anything, but being in a job where I'm in the public eye, I'm conscious about what I eat. Q26. When you’re doing your fruit impersonations, you don’t say strawberry, you specifically say Tochiotome (a type of strawberry). It’s not apples, it’s green apples (Aoringo). Do you have some hangup about using five syllables for your impersonations? Well noticed! That's a good eye you have there. The impersonations get even cuter when I use five syllables. It’s not just a strawberry, it’s specifically Tochiotome strawberries (To-Chi-O-To-Me). It’s not cake, it’s Mont Blanc (Mo-N-Bu-Ra-N). Sweet potato, that’s so weird. Q27. Since you can’t use the magic for your Momochi Musubi, who curls your hair when it needs to be curled? Generally, when it needs to be curled, the make-up artist. I curled my own hair for the dinner show though. I used a curling iron that I had bought for use when going to Yuzu-sama’s concerts. Yamaki Risa-chan and taught me how to use it. I asked Chisaki-chan a bit as well. Okay, on to the next question. Q28. What have you cooked recently? That’s not it! My frying pan has run away. Q29. Your last concert is outdoors. Will you call Yajima Maimi-chan and Mano Erina-chan? What I'll do is that I'll bring them to the venue the day before, the 29th of June. Then, I'd get them all excited. That'll summon up a storm, right? And what happens after a storm hits? The sky clears, right? Q30. Have you ever fallen in love with first sight with anything? Never. Be it something or someone. I don’t make impulse purchases. When I want to buy something, I keep on thinking about them. In the end, it's pretty common for me to go home without making a purchase. Q31. What’s going to happen to your partnership with Chinami after the 30th of June? Will you become real partners? Q32. What something you’ve enjoyed the most up until now? Q33. Any recent stories about your brother? He’s such a cute kid..
Q34. Are you now able to drink green tea? I was on an on-location shoot, where we followed the route of a local train line. There, we went to a tea shop, and I was put in a situation where I had to drink some green tea. Next to me was Ando Miki-san, and I mentioned to her that I couldn't drink green tea. So she stealthily drank it for me when no one was looking. Q35. Who suggested the freestyle rap battle introduction at the HinaFes? We originally held rap battles at events, and it's something we've gotten pretty into. We were thinking about doing some sort of talk as we walked along the passage. Since it was an introduction, we couldn't do it impromptu, it had to be set in stone. So we prepared what we would say beforehand and practised it in the dressing room the whole time. I think that we practised it for over 20 times on that day. When we were practising, we started from the youngest member. So I was last. That was the most nerve-wracking part of the HinaFes. No one wanted to fail, so the pressure was huge, we couldn’t make a mistake. But it was a huge success! We did well! I’m still watching it now. We pulled it off successfully at the real thing. It’ll be rap battle for the textbooks. Q36. 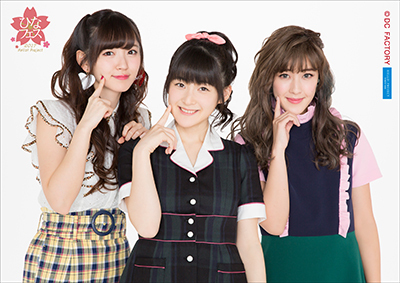 Which member will inherit Momochi’s cuteness? Q37. Favourite work by Higashino Keigo? The Devotion of Suspect X was what I started with. A staff member recommended it to me, and Ayatsuji Yukito-san’s manager had it on hand. It’s been turned into a film. I recommend it. Q38. What’s your cutest pose? Q39. What do you think about Yamaki Risa-chan’s liking of Michishige-san? She’s going to Cotton Club too much! It’s really crazy. We can request for seats for related parties at Cotton Club. Risa-chan said that she planned to go to three performances, but she asked me if going to four would be overkill. I told her that if she’d gone three times, then a fourth wouldn’t change things. So I told her to do what she wanted to do. She was like ‘Got it!’ and happily made her reservation. People of wealth really are different~! Q40. Have you talked with Michishige-san? We left letters for one another at Cotton Club's dressing room. Q41. Did you think up the HinaFes setlist? Most of it had generally been decided, and I was one of the persons helping out in making the decisions. Q42. Are you now able to make yakisoba? Q43. Recommend a novel or an author. As I mentioned just now. Q44. When half-body bathing, should we do it on the left or on the right? This question is from nickname ‘Iwasawa Kouji’. Don’t use Kou-chan’s name for these kind of questions! Anyway, for your question, please google it. You’re thinking I’m gross, but all of you are the same kind, aren’t you! You all go ‘Ah… Momochi❤️’, right! Q45. Short cut or curly perm? Q46. Did you find out what the Berryz members thought about the HinaFes? Miya just watched Yo no Naka Barairo. She laughed at me, saying that I was nervous. No different from me then. Q47. What happened to your promise to watch Detective Conan with Maasa? We haven't made plans yet. Yamaki Risa-chan likes Conan too. Recently she's become good friends with Maasa as well. So maybe the three of us might go to watch it. Q48. Do you plan to get married with Natsuyaki-san after you retire on the 30th of June? You’re asking about my relationships with Chinami and Miya. I'm so popular that it's troublesome. Q49. What’s the first thing you’d like to do once you’ve returned to being a normal girl? I'd like to bring my family on a trip as a present. But not immediately, since it'll be expensive because summer break is in July. Q50. 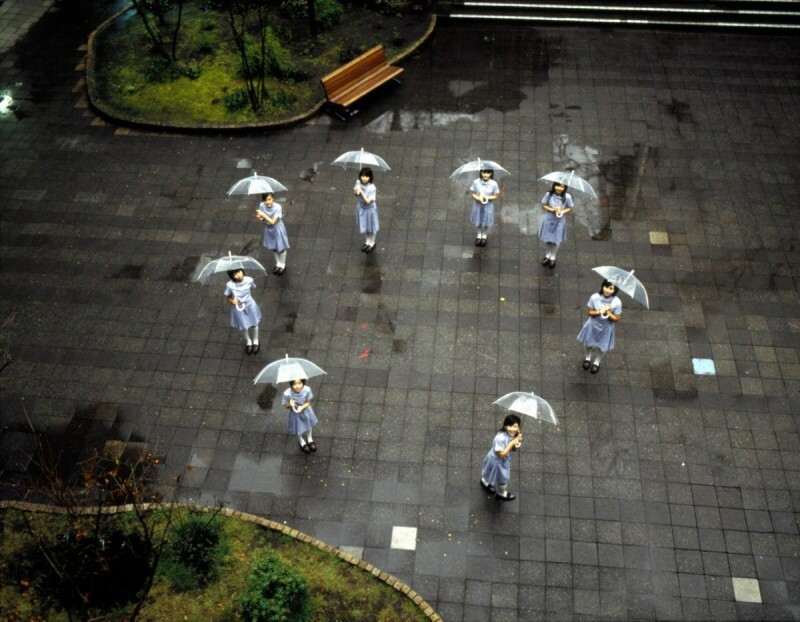 In Berryz Kobo's first photobook, you took photos with the 8 of you holding vinyl umbrellas. Where were those shots taken? I was a guest on Oshima Mai-san’s radio show, and K-taro-san joined in to chat. I brought Berryz Kobo’s photobook, but it ended without us really getting into the topic. First is this 1/3rd scale figure! How about we check if it really is 1/3rd scale? It’s bigger than 1/3rd! This is value for money! Solo slim clear file - This (front) and this (back) are Momochi, please use it at your workplace.